At present, there are two airports in Beijing serving passengers: Capital International Airport and Nanyuan Airport. With a comprehensive transportation system and perfect facilities, Capital International Airport has become one of the busiest airports in the world. Every day, nearly 1,700 flights from 94 airlines tightly connect Beijing with 244 cities from 54 countries around the world. Nanyuan Airport, with dual functions of military and civilian use, is the exclusive operating base of China United Airlines and serves 14 routes in total to more than 56 domestic cities. How much does it cost to fly to Beijing from overseas destinations? The air fare varies considerably, especially international flight ticket fare. For example, the economy class fare of the flight from New York to Beijing generally fluctuates between CNY 7,000 and CNY 50,000, but passengers may get discounted tickets of CNY 5,000 - 25,000 sometimes. Flying from Beijing to London averages about CNY 10,000, but you may get a cheaper ticket of CNY 5,000. 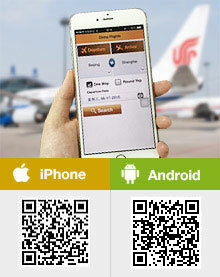 The full fare from Sydney to Beijing is about CNY 14,000, and a special fare may be around CNY 5,000. 1. Keep an eye on the ticket fare 1-3 months before departure. Airlines release discounted tickets based on the passenger flow. Generally, the earlier you order, the higher discount you get. But this is not always the case, so whenever you find a cheap ticket order it without hesitation. An easier way is to register on the airlines official websites to get their memberships and they may send you e-mails or messages when there is a promotion. 2. Fly to nearby Tianjin instead. Generally, the international flight ticket fare to Tianjin is lower than that to Beijing. For example, if you fly from Singapore to Beijing, the fare is about CNY 3,000 - 7,000. But the flight from Singapore to Tianjin only costs about CNY 800 - 3,000. Tianjin and Beijing have been connected by high speed trains, with a duration of around 40 minutes. A second-class seat ticket fare costs around CNY 60. 3. Buy round trip tickets to get a larger discount if possible with your itinerary. The onward ticket fare of an international flight is higher than that of the return trip due to fewer passengers on the back-trip. 4. Search and compare ticket prices on different booking websites or APPs, like Sky Scanner. 5. Take the cheap airlines, such as Air Asia, Spring Airlines, Cebu Pacific Air, Tiger Airways, Ryan Air Limited… But pay attention to their baggage allowance. Sometimes the charge on extra baggage leads to high expenses. 6. Take red-eye flights. The short-distance flights at night are usually cheaper than those in daytime as they are less attractive to passengers. 7. Telephone booking sometimes brings unexpected surprises. It is located on West Jichang Road, Shunyi District, 25 kilometers (15.5 miles) northeast of downtown. Three terminals are in service: T1 for domestic flights, and T2 and T3 for domestic and international flights. 16 airport shuttle bus lines and an airport express train transfer passengers to the urban area. It lies in the Fengtai District, a southern suburb of Beijing, about 15 km (8 miles) south of Tiananmen Square. So far, there is only one terminal building for departure and arrival and only domestic routes are operating from this airport. Three airport shuttle bus lines and one city bus route connect the airport with downtown. Hello, are in China (Beiging airport) some limits for export of tea, spices or other small items bought for personal purpose in a local markets such a gift for my friends? Thnx. How much can i carry ? I am going to india from beijing ;how much amount of alchol can i carry ? one or two bottles of wine for self use should be possible. For the domestic trip from Beijing to Yiwu, it should be 20kg checked luggage for free and 5kg carry-on. For this international trip, it should be 1 piece checked luggage within 23kg for free and also 5kg carry-on. how much is the air ticket from Beijing to Changsha? The full price for Economy Class should be about USD220, but usually there are discount offered. The discount changes from time to time, a good discount may even around 55% off.